Being curled up in a book rental store and poring over a book more diligently than one ever studies for school.... Such is a common shared memory among most Taiwanese people. Book rental stores have been with Taiwan for a while, so it's worth wondering what part of their history have readers been part of? The National Museum of Taiwan History's "My Fantasy Book Rental Store: The Change of Book Rental Stores in Taiwan" exhibition invites visitors to grab a book from the shelves and relive memories of voyaging into fantastic worlds through the pages of comics and novels. 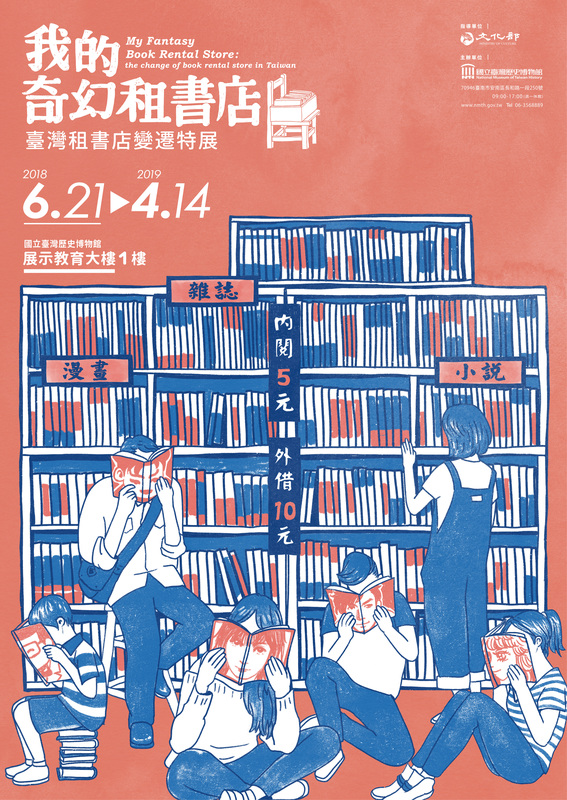 Hand-painted illustrations and themed timelines are also used to explore the development of book rental stores in Taiwan. From the old photos on show, visitors can see the predecessors of book rental stores, the Japanese-era kashihon'ya (貸本屋), which were essentially mobile stalls that rented and sold novels and other books. After the war, they moved into renting out koa-á-hì or Taiwanese opera scores, picture books, wuxia or martial arts novels, and serialized comics and novels. Book rental stores were among the first businesses severely impacted by the enactment of martial law in Taiwan. Romance and wuxia novels with historical settings were labeled as "communist propaganda" and adult materials dubbed "immoral," resulting in the authorities banning and destroying many book collections. Book rental stores became the frequent subject of police concerns, and with what amounted to thought policing on the rise, translated "non-ideological" knock-off comics from Japan and elsewhere began to flourish. As Taiwan's economy boomed, newspaper supplements grew, enticing readers with entertaining serialized novels and comics. The collected manuscripts of these also became sources of inspiration for local novelists and comic artists today. In the late 1970s, book rental stores began to turn their attention to three main genres: romance, wuxia, and comics. The borrowing rules and rental records on display at the exhibition not only speak to how book rentals began to focus more on fixed locations and the ways the rental market changed in the 1980s, but also to how such stores used customer preferences and feedback to shape a unique relationship with retailers and publishers. Over the next two decades, book rental stores focused more and more on improving their decor, book selections, and service as they entered their golden age. As the internet boomed at the turn of the century, book rental stores began to expand into more diverse service venues, offering music, movies, food, drinks, and web access. Through this evolution, they helped Taiwan's entertainment and cultural industries turn over a new page. History is about how people used to live and the shared memories that they have created. By looking at the smaller details of daily life, visitors will gain a better insight into the broader changes that came with time. The existence of book rental stores, for example, is testament to mainstream culture's appreciation for reading, and their growth and development echo changes in lifestyles and society, the impact of martial law, the move to rule of law, and even the evolution of the industrial chain formed of publishers, distributors, and book rental stores. By offering a way to explore these communal memories, this exhibition aims to also help visitors understand the connection between history and daily life. Visitors Today:109. All Time Visitors:1,229,916.